While the Enlightenment desktop is fantastic, there is no doubting that in all it's grace and glory it is a bit different from other desktop environments. While I know there are some people (such as myself) that like to just muck their way through things on their own, I also know that others like a bit of a guide to follow along with. A couple of months ago I made a post detailing the answers to some common questions those new to the Enlightenment desktop have. Today I would like to address a few more such questions and give a few tips I have picked up over the years. 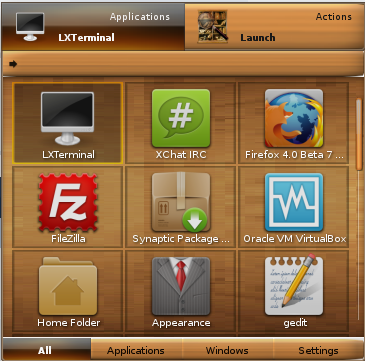 One application you often see recommended for Linux desktops is Gnome Do, a quick launcher that allows you to quickly find and launch applications that are installed on your Linux desktop. 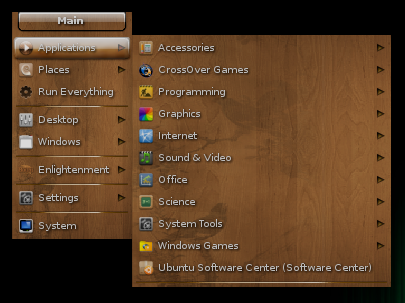 There is no need to install Gnome Do under Enlightenment so long as you have the Everything Applications module loaded. You can launch Run Everything from either the main menu or by hot key (alt+escape or super+space). Once it is launched simply start typing the name of the application you are looking for and then press enter once it is highlighted. 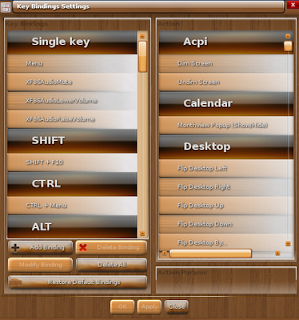 You can also navigate the listed applications with the arrow keys. The launcher also remembers which applications you use - so after a day you can find your applications even more quickly! There are a lot of useful (non-standard) key binding setup under Enlightenment by default. It is worth searching through them to see what is there. One of these I would like to mention is that alt+fX will change to your desktop X (Through 12 of course). Once you get past how intimidating this message looks - take a deep breath - and press F1. Your screen will flicker for a moment and then everything should return to normal. 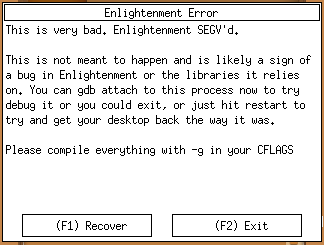 Enlightenment is the only desktop that can crash and still save the state of all the applications you have open. It is important to note what you where doing when the crash happened and then report it to your distro creator (or right to the Enlightenment folks if you are compiling from SVN). If you think of any other Enlightenment questions I haven't covered thus far - please feel free to drop a comment below asking. In the past, I was impressed with "3D-ish" acceleration/speed/effects of Enlightenment (although is only 2D). Are you also including Compiz in your Bodhi Linux when the hardware can handle it? I find it rather ridiculous that E17 is still in Alpha state after 10 years! It still isn't ready for production use. THe question is if it ever will be. Therefore I will not use it. I have tried it in the past, but it never was 'complete'. Nice article, but I will not use E17. Hiccups every now and then? I must be unlucky then, I booted bohdi from a live cd, and it kept throwing that error about 30 seconds after boot, and every 30 seconds after. I don't have the knowledge to track down the source of the error, so I guess I'll be waiting for beta to try again. Works rather well with me. And even the crashes are smooth. I am amazed at how Bodhi/enlightenment handle crashes - everything seems to reload without much fuss at all. Worblux might be having hardware issues..
Anyways, I`m using enlightenment16 in Debian - yaknow, old, stable yaadayaada - and it`s quite solid and really blazing fast. Kinda like OSX eyecandy without the need for expensive proprietary hardware. Not to mention the configurability of enlightenment. These usually occurred after one of my braver attempts to add software from the Ubuntu repos rather than the Bodhi website .bod packages. In the same period Ubuntu Natty has (on occasion) fallen over, locked up, lost the mouse pointer, and just plain refused to boot cleanly that many times in one hour. E17 is an old friend - eLive used to be pretty flaky last time we tried it.... but we find that so far Bodhi is a step ahead of current Ubuntu for stability, which came as a pleasant surprise. Very helpful, Jeff, thank you. You mention it would be good to scan through the various key bindings... but how does one do that? Look for the "keys" option in your settings or via "run everything"